Long before conspiracy theories abounded or distrust of the government became de riguer, there seemed to be a kind of mythology about UFO’s. One show described an ancient site in South America that was given the insipid name of EarthBaseOne, which (after decades of retrospect) looked like an Inca temple. 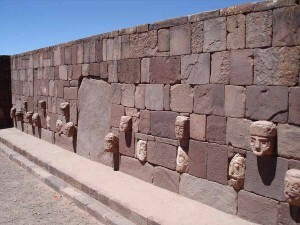 It was a large square, with no roof, and in the walls of the square were carvings of skulls. One was human, and the others (all around the walls) were slight variations on human faces. Some were very similar to our current visage, while others were grotesquely misshapen. A quick Google search revealed that the site’s real name is Tiahuanaco, in Bolivia. Anyway, the show put forward the idea that extraterrestrial life forms created humanity, and that Tiahuanaco was the place where they worked out their ‘design’ for us. An interesting theory, and one that I’ve never forgotten. So anyway, I got to thinking about all that UFO business again this afternoon, and I really wanted to see the show “Project U.F.O.” again. It took longer than I would have thought to scrounge up an actual episode (Due to a government cover-up, perhaps? KIDDING! ), but here’s one for you. Warning: WATCH THIS CLIP AT YOUR OWN RISK. It may have been based on an interesting premise, but the show is a complete and utter turd. Do not attempt to drive or use heavy machinery after watching it. There, see? I warned you. One of the major theories I’ve heard is that aliens came and fucked the monkey…. How else do you explain Mozart?